The hallways were buzzing, and “prom, prom, prom” was all I heard. For some, the days leading up to prom were filled with anxiety, excitement, and expectations as the “night to remember” promptly approached. SHS junior Jordyn Kamara says she had butterflies in her stomach but she was still excited for prom. “I was nervous but excited,” said junior Kaisa Jensen. Junior Anthony Farrell says that junior prom is a time to have fun given that students do not get many opportunities to dance and hang out with each other as one big class. Senior Sapaleto Murphy says that he did not have a date for junior prom so he did not go. “I thought it would be weird to go by myself. I did not want to be ‘that guy’. I personally do not care about prom. It is not that important to me but I might go to senior prom,” said Murphy. English teacher Mr. Bacigalupi says that there was no “prom-posals” back when he was in high school so the expectations of guys are different today. “I went to junior and senior prom and it was over hyped. Going with a friend eliminated the expectation and pressure to have a romantic moment. We kept it fun,” said Mr. Bacigalupi. “It is a little overrated to me though. I feel like you can ask someone to prom without the big posters and signs. It does not have to be public. It is also a lot of money but prom is a good memory to have,” said Anthony Farrell. “There are social expectations. It’s like you have to go to prom. The stuff associated with going to prom like ‘prom-posing’ to your date, having to put on this big production, and buying a corsage. It’s like taking your girl out to eat. You pay for her dinner,” said Senior Eric Ross. “People are under the impression that boys have to pay for the ticket,” said Senior Ryan Litner. “Girls paid for the Semi-Formal tickets last year, so it is only fair for the boys to pay for our junior prom this year,” said Jensen. Junior Ayla Karasahin says that there was a lot of pressure for girls to look perfect and out-dress everybody else. “Sometimes there can be a lot of drama that comes with finding a prom date as well,” said Karasahin. Mr. Bacigalupi says that most gentlemen wear tuxes, so they do not have to put as much thought into their whole outfit. “We [boys] all looked the same in our suits,” said Senior Navi Antelman. “Every girl should have just worn the same dress,” he jokingly added. Mrs. Levitts says that she spent 10 hours with her daughter in addition to shopping in 2 states, Massachusetts and Rhode Island, to find the perfect dress. “It is emotionally and financially draining. It is a lot of pressure as a parent too, having to book the hair and nail appointments,” said Mrs. Levitts. Ryan Litner says that prom is expensive. “For the tickets to be 75 dollars, the food should have been better last year,” said Litner. “I went to high school in New York. It was not popular back then so I never went to prom,” said Mrs. Levitts. 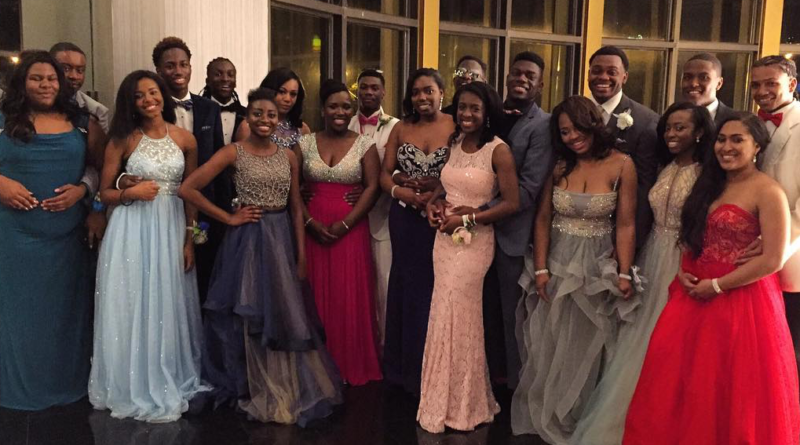 “Everybody looked great,” said Jordyn Kamara.